FUTURE PARK won a major prize at MIPIM, having been voted as one of the best schemes on show at the annual property conference. 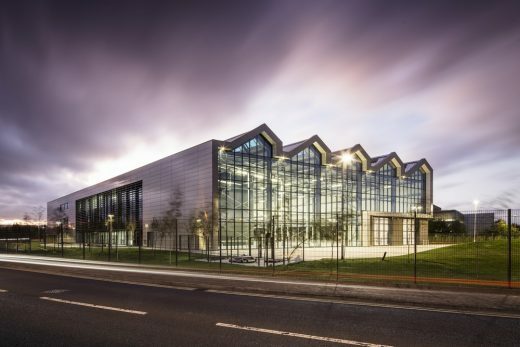 National College for High Speed Rail, Doncaster is one of seven buildings to win RIBA Yorkshire (Royal Institute of British Architects) 2018 Awards. 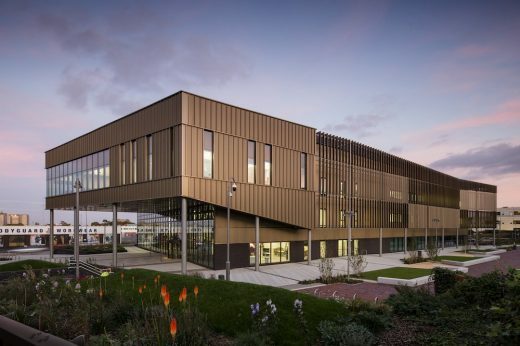 National College for High Speed Rail, Doncaster, and SHU Institute of Education, Sheffield, are two of thirteen buildings have been shortlisted for RIBA Yorkshire (Royal Institute of British Architects) 2018 Awards; the winners will be announced at an Awards evening at The Museum Gardens, York on Thursday 24 May. This Sheffiled architects practice attended the West Midlands, Insider Media Property Awards 2017 and scooped the Highly Commended, Construction Project of the Year Award for The National College for High Speed Rail, Birmingham. The University of Kent (UoK) has commissioned a new School of Economics, designed by Bond Bryan Architects, which achieved planning consent in August 2017. This is a collaborative scheme with Willmott Dixon Construction and is part of UoK’s continued investment into its Canterbury Campus Masterplan and part of a new Business Hub focusing on Economics, Business, Maths and Statistics & Actuarial Science. Nottingham College City Hub appoints this Yorkshire architects practice to design a campus of the future. New College Nottingham and Central College have appointed a team of award-winning architects to take forward their plan for a ‘hub for skills’ in the city centre. Bond Bryan, Sheffield based architects with offices around the world, have won the project in a highly competitive open design competition and will add the ‘Nottingham College City Hub’ building to an already impressive collection of Nottingham projects under their belt. This will be a Four Form Entry Secondary School accommodating 800 pupils (including 200 sixth form pupils) with approximately 50 teaching staff and 15 – 20 Administrative support. The academy building will provide 6,492 sqm of new accommodation over two – three storeys. 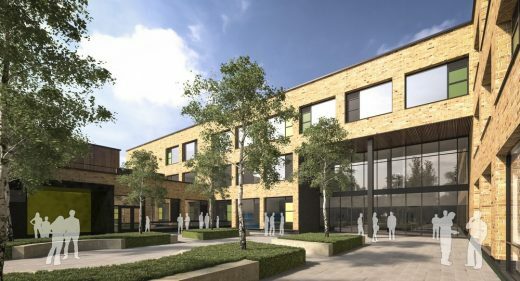 Construction of the £7.6m Post-16 Centre at Phoenix High School in Shepherds Bush, London has been completed and has been handed over to pioneering Executive Head Teacher Sir William Atkinson. The building has been dubbed the ‘liqourice allsorts’ school because the elevations comprise vertical timber panels repeated at random intervals and framed with vibrant colours, visually akin to liqourice allsorts. The 10,000 square metre academy, for pupils aged 11-18, is co-sponsored by the charity Toc H and by Bradford Church of England Diocese and replaces Bradford Cathedral Community College. Bond Bryan Architects, have incorporated the 15m by 30m two-storey forum into the centre of the building. University of Sheffield’s £4.4 million environmental research centre with ‘bee holes’ handed over – WWII bombsite rubble forms basis of site covering artesian well The University of Sheffield’s new Arthur Willis building, complete with ‘bee holes’ for insects to fly in and out, has been handed over by Bond Bryan Architects. 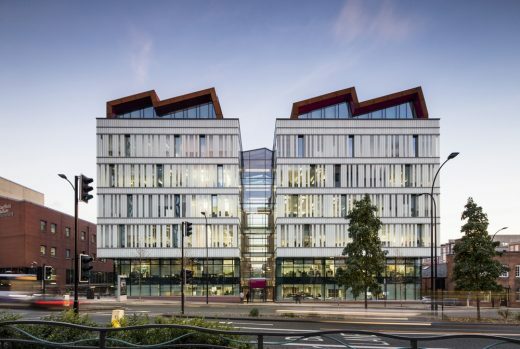 Sheffield Hallam University’s new Furnival Building will boast some of the most sustainable and energy-saving features anywhere in the city. The previous two-storey 1950’s building, within the Cultural Industries Quarter (CIQ) and formerly home to Grahams Plumbers Merchants, has been demolished and construction of the new building has now begun. Westminster Kingsway College’s brand new King’s Cross Centre has now opened. 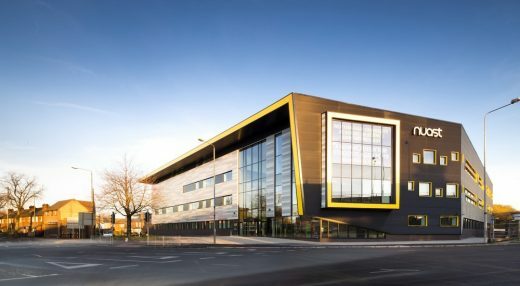 The £52.5m building – delivered on time and on budget – was completed under the Government’s Building Colleges for the Future programme and was funded in part (55%) by the Learning & Skills Council. The 8000 square metre building, designed by one of the education sector’s leading architectural practices Bond Bryan is on a prominent gap site opposite St. Thomas’s Green and will become the new ‘front door’ for the University. It will provide threshold space for visitor and student access, a combination of open plan offices, meeting rooms and support areas. 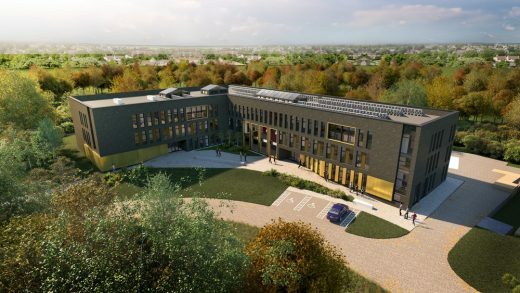 Oaklands College has received planning permission from St Albans District Council for a new-build college designed by Bond Bryan Architects. The college is amalgamating its current separate sites in Borehamwood, St Albans City Campus and Welwyn Garden City into a central campus at St Albans Smallford. Sheffield’s largest architecture practice has received planning permission for its design for the £8.5 million Advanced Manufacturing Research Centre (AMRC) for the University of Sheffield, to be built on The Advanced Manufacturing Park, off the Parkway. 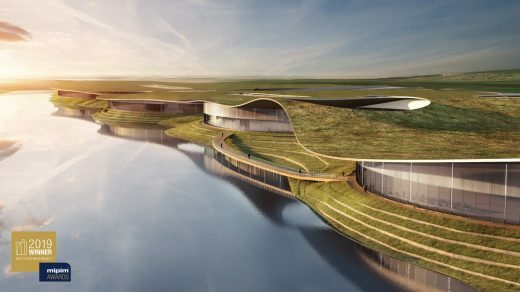 Architect office based in England, UK. Headquarters in Sheffield, sub offices in Westerham Studio (Kent), Kuwait & Qatar. March 15, 2019 in Architects.